We're proud to have Alessandro Urilli representing Le Sinfonie with us this year at stand D46 with Elenka Spa. Be sure to stop by and witness his unbeatable baking and pastry demonstrations. Don't forget to bring your notebook to steal some of his best tips for producing his outstanding creations. Le Sinfonie comes from theAgugiaro & Figna family and currently offers a premium offering for pastry and baking worldwide. With an outstanding Executive Pastry Chef career spanning more than fifteen years, Alessandro Urilli has developed all the skills and knowledge required to grow any company in the industry. He currently collaborates with internationally renowned brands to develop grow their business in the following areas: Pastry, Bakery, Gelato, Chocolate, Decoration, Wedding Cakes, Chocolate and Sugar sculptures. Alessandro's background combines unique experience in managing several production kitchens and at the same time, marketing a range of products for top international quality companies. Alessandro is also a pastry art article writer for internationally renowned magazines such as www.pasticceriainternazionale.com. His credentials includes a Food Technology in Culinary Arts degree in the Baking industry and he is also an instructor and demonstrator in all the pastry products and aspects, with experience in training new staff and conducting product demonstrations to show the benefits and applications of each product line. As a result, Alessandro and his team can consistently deliver over-quota results. We're thrilled to be exhibiting at Fine Food Australia alongside our partner Elenka Spa this year! We will be showcasing a large range of mould and equipment so it will be a great opportunity for us to catch up! Make an appointment or simply pop by for a coffee at our stand - D46. This year we're lucky to have talented Pastry Masters Nino De Pasquale and Alessandro Urilli whipping up some amazing creations for us using Pavoni Italia products. 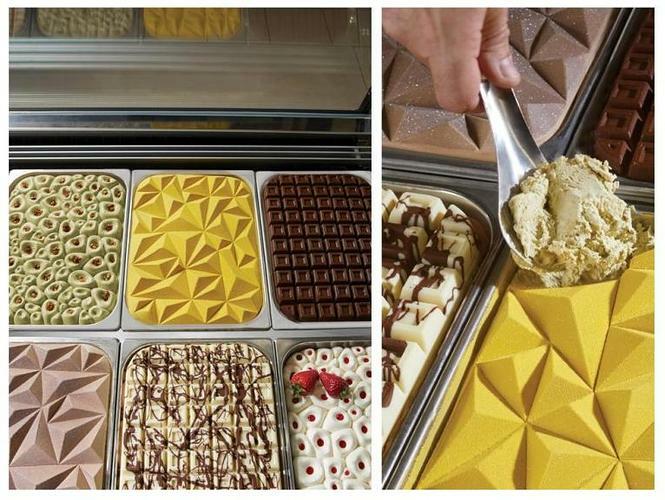 Introducing Pavoni Italia's latest decorative silicone moulds for gelato pans. Create the perfect moulding with any creamy product (hazelnut, pistachio cream, fruit glaze or even directly with gelato). Cool down in the blast chiller to pull the product out of the mould. Decorate the top with a delicate velvet effect, a glaze or just leave it natural. Voila! Up until the 1980’s all pastry products in Italy were handmade. Due to the hard physical work, the end result was always a successful outcome, especially when production reached high quantities. No one can understand this situation better than Mr. Giorgio Cassibba who experienced this first-hand and for 24 hours per day. As a result, in 1985 Cassibba Prodotti Dolciari was born, with an objective for stimulating the imagination and creations in all shapes and sizes for all hospitality professionals. Combining the best traditional Italian pastry recipes using the best cutting-edge technologies, Cassibba is today a leading manufacturer of biscuits, semi finished pastry products and shortcrust tartlets. Professionals are able to reduce working time and focus on innovation and growing their product ranges. PAVONI ITALIA introduces you to the latest products TUTTIFRUTTI signed by the World Champion Emmanuele Forcone. An assortment of five silicone moulds to create original dessert and surprising monoportions to give your window displays a fantastic visual appearance. Antonio Bachour is an award-winning American Pastry Chef, who is renowned worldwide for his interpretative skills and for the passionate imagination of his creations. His international training, in constant evolution, has led him to be named one of the top ten Pastry Chefs in the world. This year’s Bulla Pastry Stage features masterclasses led by the likes of Christy Tania, internationally acclaimed pastry and dessert chef and recent judge on MasterChef Australia; Darren Purchese, owner and pastry chef behind Australia’s successful Burch & Purchese Sweet Studio, and Emmanuele Forcone winner of 2015’s Coupe de Monde de la Patisserie. The stage will be located in Bakery World and is sponsored by Bulla, and the equipment is provided by Vanrooy Machinery. All sessions are free to attend and no bookings are required.